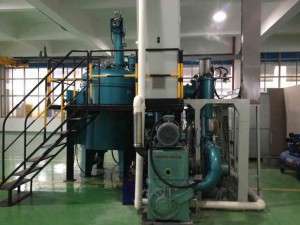 A vacuum furnace is a type of furnace that can heat materials, typically metals, to very high temperatures and carry out processes such as brazing, sintering and heat treatment with high consistency and low contamination. 4、Quick cooling (quenching) of product. 5、The process can be computer controlled to ensure metallurgical repeatability. An inert gas, such as Argon, is typically used to quickly cool the treated metal back to non-metallurgical levels (below 400 °F) after the desired process in the furnace.This inert gas can be pressurized to two times atmosphere or more, then circulated through the hot zone area to pick up heat before passing through a heat exchanger to remove heat. This process continues until the desired temperature is reached.